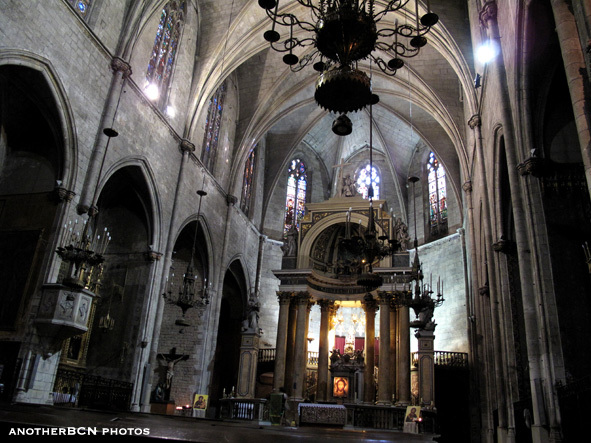 Today we’re going to talk about a short tour around the Gothic Quarter based on myths and legends of Barcelona. 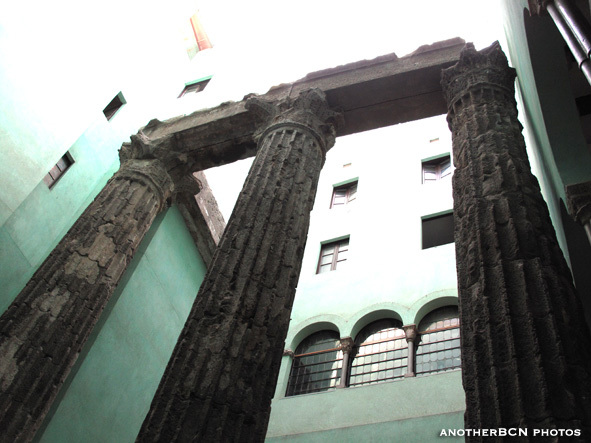 We’ll start off with the remains of the four Roman columns (three are from the original temple) which are in the building that houses the headquarters of the CEC (Catalan Excursionist Centre), located in a small street, Carrer Paradís, which joins Plaça Sant Jaume and Carrer de la Pietat. These columns, remains of the ancient Temple of Augustus, are found at the highest point of the city (16.9 m) on Mont Tàber, which is where the Roman city was established. These remains, and many others which have been found around Barcelona, help us learn about our earliest origins after the Íbers. In order to prevent Barcelona from having such ‘banal’ origins, over the years several legends have appeared which have endowed Barcelona with a more original history. On the one hand, it is said that the city is of Greek origin and that it was founded by Hercules. On one of his numerous journeys, nine ships became separated, of which eight managed to group back together and they set off to search for the ninth ship, which they eventually found moored at the bottom of the hill of Montjuïc. The members of the crew fell in love with the area, so they decided to found the city which they named Barca (boat) Nona (ninth), Barcanona. It is also said that Hercules met a beautiful girl, Pyrene, with whom he madly fell in love. However, they were unable to share their love for more than two months because their journeys prevented them from staying together any longer. And this where the name ‘Pyrenees’ comes from. On the other hand, the city’s origin was attributed to the Carthaginians, to Hamilcar Barca, Hannibal’s father. 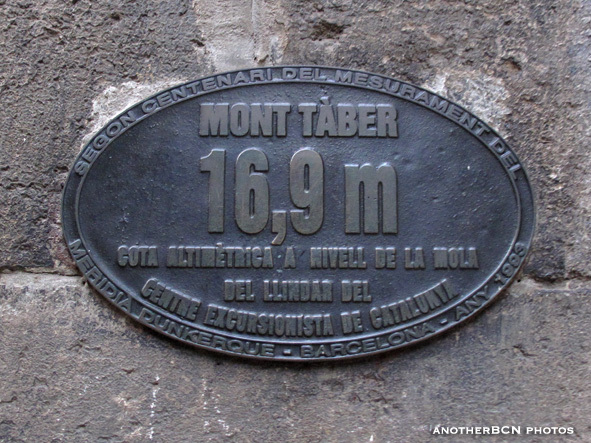 He arrived in this area and founded the city, then gave it his surname, Barca. At an etymological level the theories of these origins are totally acceptable, although they lack historical or archaeological grounds. 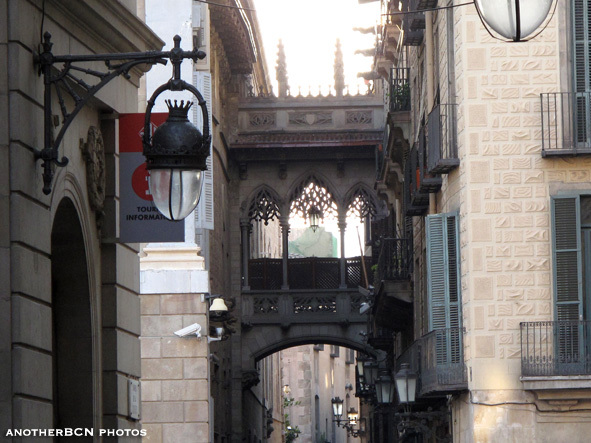 Carrer Hercules is the street that takes us to Plaça Sant Just, a quiet square with a great deal of history to tell. There we find a Gothic water fountain, which dates back to the 14th century; legend says that it was created by Joan Fiveller, who was hunting in the forests of Collserola when he came across a spring whose water he channelled to where the fountain is today, near his palace, and which still works today. It was the first important public fountain in the city and it is the oldest one in Barcelona. At the top of one of the sides, it is possible to make out a falcon catching a partridge in honour of its creator and his hunts. Situated in the same square is the Church of Sant Just i Pastor, a Gothic church dedicated to two boys, Justus and Pastor, who are venerated as Christian martyrs. Some authors affirm that the myth of the two martyrs is the conversion to Christianity of two brothers, Cástor y Pólux. On the other hand, it is said that the church was built on an ancient temple for a religious cult that worshipped Mithras. Mithraism was a mystery religion of an initiative kind that was popular during the Roman Empire. Inside, there are some valuable Byzantine-style fonts of blessed water that come from an ancient Visigoth chapel that once existed in the place. It is interesting to note that until 1995, the church maintained a curious privilege for the citizens of Barcelona: anyone in danger of death could make their will before another person who would then go to the church and, in front of the altar, could state under oath what the dying person had said, and it was considered to be a legal Last Will. And finally, Palau Moxó, the palace of the Marquises of Sant Mori from the 18th century, which stands out for its floral decoration on the façade. It is said that under the square there is an underground river, which lets you feel the heat it gives off and fills you with renewed energy. If we take a walk around the narrow streets of the Call, the old Jewish Quarter during the Mediaevel period, we’ll see that the streets conserve their original narrow and haphazard structures. Nestled among the streets is the Sinagoga Major (Main Synagogue), which is said to be the oldest in Europe. On the right of the door lintel we can see a hole, Mezuzah, which identifies a Jewish home and reminds us that we need to remember to pray when we enter or exit a home. For many years, this district was where Jews lived during the Middle Ages. The protagonists of a great number of injustices, in Barcelona they were also victims of expulsions and assassinations. When the district was dismantled, the stones from the houses and cemeteries were used for other buildings, which is why in some areas of the Gothic quarter (for example, Carrer dels Comtes) we can see walls with inscriptions written in Hebrew. We’ve arrived at the Plaça del Rei. This square was where the Palau Reial Major (Grand Royal Palace) stood. It was the residence of the Counts of Barcelona, where the Saló del Tinell (Tinell Hall) is found. In the same square, on the right, we find the Chapel of Santa Àgata and on the left, the Palau del Lloctinent (Deputy’s Palace), historical buildings that date back to the 14th century. For many years the square was used as a marketplace until the king suddenly got tired and decided that the market would no longer be held in the area due to the daily hullabaloo that prevented him from sleeping. The executioner lived in the same square. His job was very hard and no one wanted to exercise the profession. For a long time, a small bag containing money was left in a corner next to the tools needed for the execution and a volunteer used to take the money and appear the next day to carry out his task. There were occasions when nobody used to appear because if you were an executioner you would be rejected by everyone. During that period, butchers were appointed to be official executioners since they were experts in handling the tools that were required for performing an execution. After a number of suicides committed by people who did not want to perform the execution, the guild decided that they would stop being responsible for carrying out such a task. This eventually meant that an official post had to be created for the executioner, who would work as a royal employee and receive some additional benefits, including the right to live in a small house attached to the Chapel of Santa Àgata and the possibility to sell the possessions that had belonged to the people who had been executed. In this sense, the executed people’s shoes were coveted items because it was believed that if the shoes were placed in the entrance to a home, they would protect it from bad spirits. Before reaching the Plaça de Sant Felip Neri, and bringing our tour to an end, we will take a look at the Casa l’Ardíaca (Archdeacon’s House), in Carrer de Santa Llúcia, which was the home of the ecclesiastical hierarchy of the archdeacons in the 12th century whilst the cathedral was being built. The house was reformed in the 15th century to the style of contemporary palaces. Given that the house was limited by the Roman wall and the interior Cloister, which at that time was usually in the centre, it was necessary to rebuild the the entrance. In the small Cloister there is a small fountain where every Corpus Christi an egg is made to dance over the jet of water: it corresponds to the actual tradition of “l’ou com balla” (the dancing egg). Before entering inside the house, on the right side of the entrance, there is a modernista letter box, designed by Domènech i Muntaner, dating from when the house was used as the seat of the Bar Association. The letter box is decorated with swallows that remind us that the post should ideally fly but the tortoise symbolises the pace at which it really moves. Anyway, if you stroke the tortoise’s shell, we get rid of the bad luck the skull gave us earlier. Now, to end the tour, we will visit the Plaça Sant Felip Neri, the most enchanting square in Barcelona. The Church of Sant Felip Neri, from the Baroque era, stands in this square. The Shoe Museum is also in the same place, since it was an area where there was a concentration of guilds. 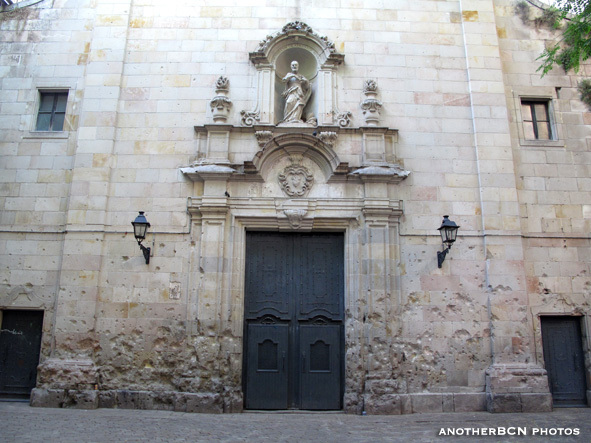 A false legend, which began in the 20th century to explain the holes that can be seen in the walls around the square, is that they were caused by the executions made by firing squads during the Civil War. After inspecting the holes, pure logic and reasoning causes us to discard this idea, mainly because the holes are of a variety of sizes, shapes and heights, although human brains are capable of conjuring up anything, LOL! In reality the holes were caused by the shrapnel from a bomb that exploded near the area. Just for interest, one of the scenes in the film ‘The Perfume’ was shot in this square. Although there’s much more to discover in the Gothic Quarter, we’ll finish our tour of myths and legends here. We’ll talk about the cathedral of Saint Eulalia another day, because she has many things to tell us.